The following is a guest post by NDIIPP summer intern Elizabeth Tobey. Liz is a graduate student in the Masters of Library Science program at the University of Maryland. Along with the fall weather, food, activities and the new layer of clothes that are now necessary, this season also brings us a new and improved Viewshare. 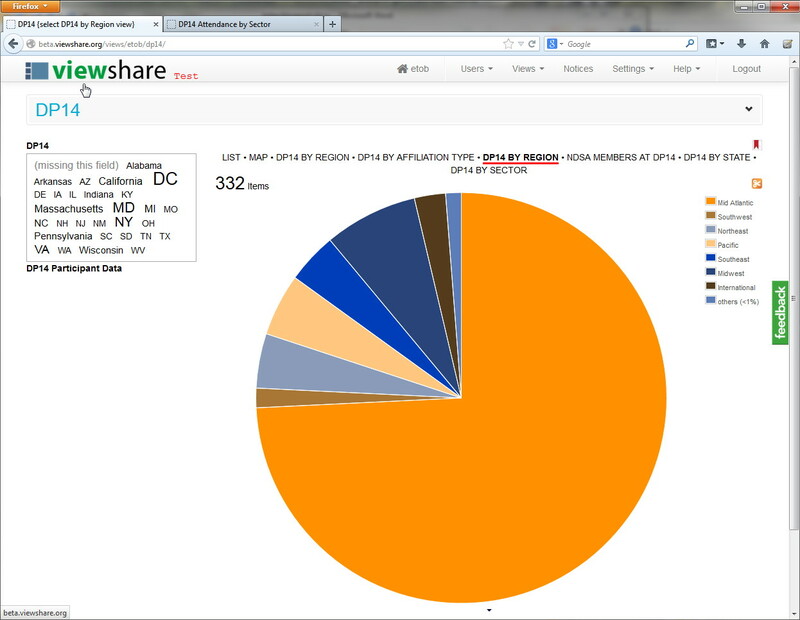 The new Viewshare has all the capabilities of the previous version but has a simplified workflow; an improved, streamlined look; and larger and more legible graphics in its views. Originally launched in 2011, Viewshare is visualization software that libraries, archives and museums can use for free to generate “views” of their digital collections. 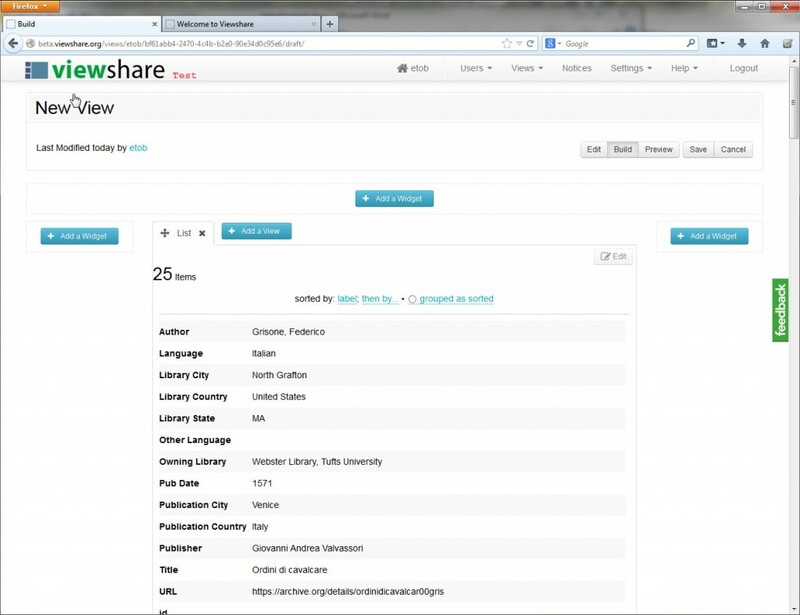 Users have discovered a multitude of applications for Viewshare, including visualizations of LAM (Library, Archives and Museum) collections’ data, representation of data sets in academic scholarship and student use of Viewshare in library science classwork. 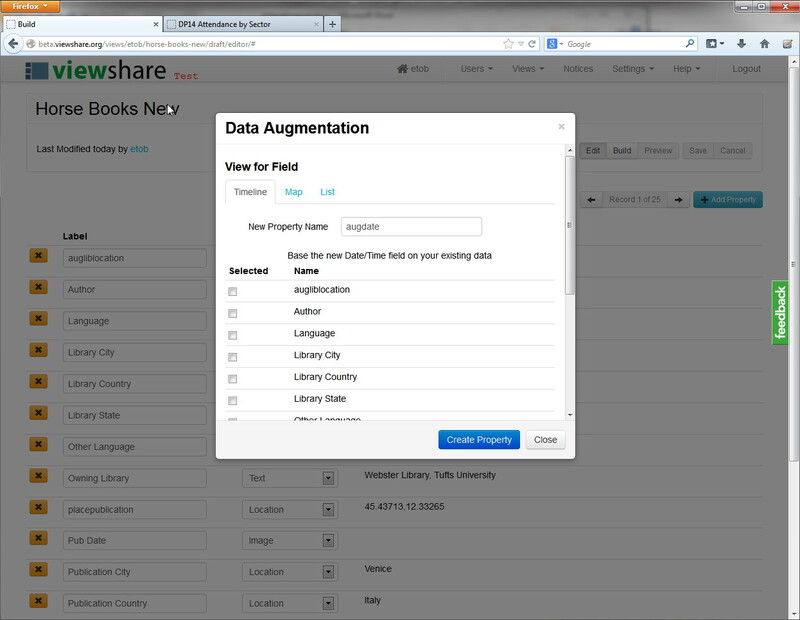 The new version of Viewshare has streamlined the workflow so that users can proceed directly from uploading data sets into creating views. The old Viewshare divided this process into three distinct stages: uploading records, augmenting data fields and creating/sharing views. While all these functions are still part of the Viewshare workflow, the new Viewshare accelerates the process by creating your first view for you directly from the imported data. Once you have uploaded your data from the web or from a file on your computer, the fields will immediately populate records in a List View of your collection. You can immediately start reviewing the uploaded records in the List View, and if you choose, can begin creating additional views once you save your data set. List View of uploaded data set. Once you save your data set, you can start adding new views immediately. Like in the old version of Viewshare, you will need to augment some of your data fields in order to get the best results in creating certain types of views, such as maps based upon geographical location or timelines based upon date. Viewshare still needs to generate latitudinal/longitudinal coordinates for locations and standardize dates, but the augmentation process has been simplified. Augmenting fields has also been streamlined. A status bar alerts users to the progress of augmenting fields. Another great feature of the new Viewshare is that whenever you make changes to a record field (such as changing a field type from text to date), Viewshare saves those changes automatically. (However, you still need to remember to hit the “Save” button for any new views or widgets you create!). 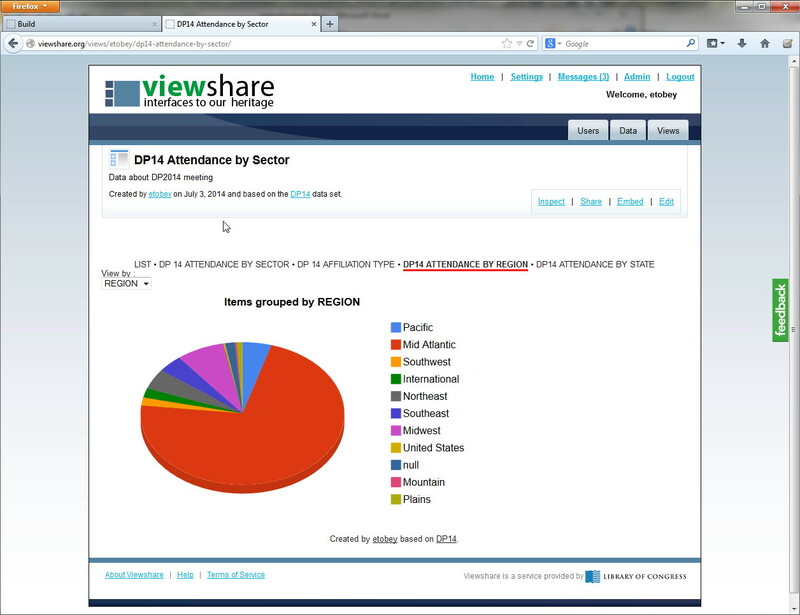 Here, the pie chart occupies more than half of the screen and is displayed flat rather than tilted. This new style of view renders Viewshare graphics much more legible, especially when projected onto a screen. Navigation has also been streamlined. 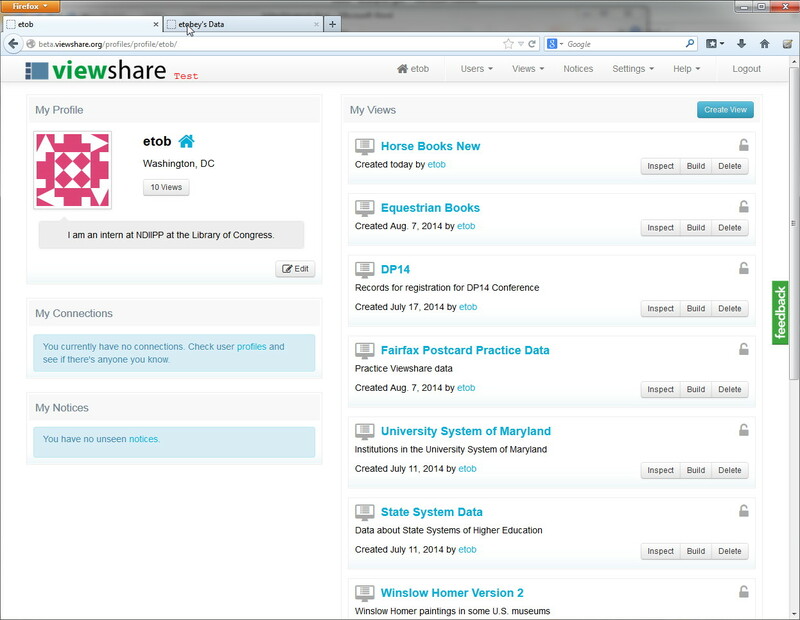 Instead of multiple navigation options (a top menu and two sets of tabs) in the old Viewshare, the navigation options have been consolidated into a dropdown menu at the upper right hand of the browser window. Thus, it is easier for users to find the information they need. 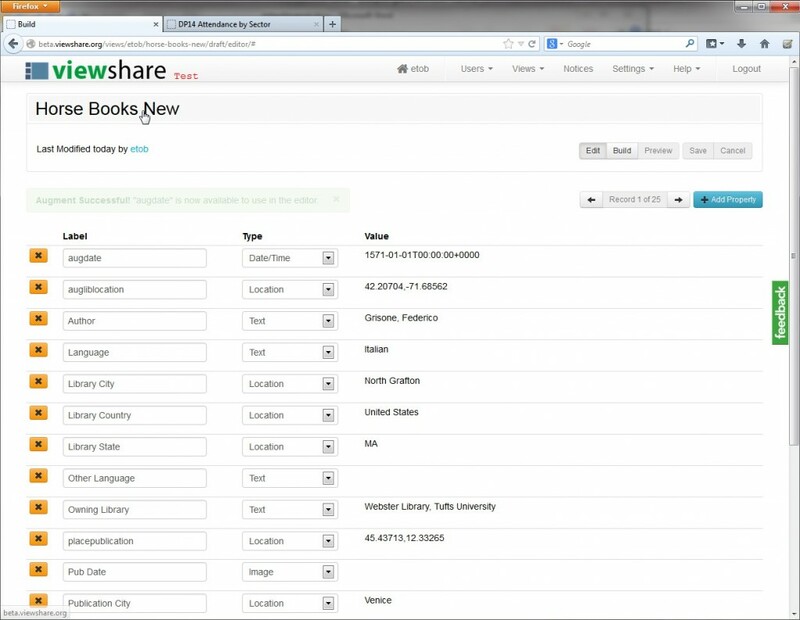 Some users may wonder whether the new Viewshare will affect existing data sets and views they have created. Viewshare’s designers have already thought of this, and, rest assured, all existing accounts, data sets and views will be migrated from the old version to the new version. Users will still be able to access, view, embed and share data sets that they uploaded in the past. 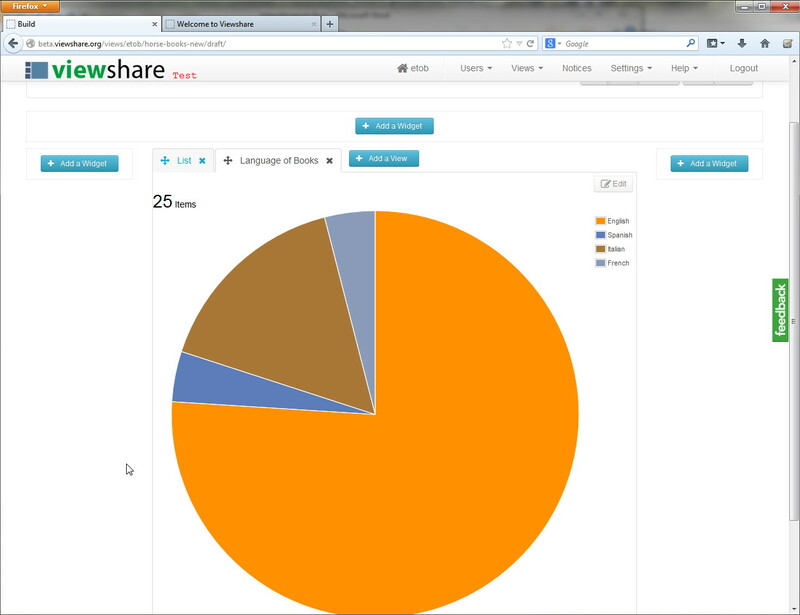 Many of the changes to Viewshare were influenced directly by user feedback about the older version. Here at the Library of Congress we are eager to hear your suggestions about improving Viewshare and about any problems you encounter in its use. Please feel free to report your problems and suggestions by clicking on the green “Feedback” tab on the Viewshare website. You should also feel free to add your comments and contact information in the comment form below. Enjoy the rest of fall, and make sure to take time to check out Viewshare’s new features and look! This is a syndicated post. Read the original at The Signal: Digital Preservation 2014-10-21. ← Wages of Sin: Open Access is growing in theory but not in substance.